Are you tired of all the cups your children leave laying around the house? You are not sure whose cup is whose. They’re all drinking from the same vessel and spreading their germs. Do you search for an alternative to the sippy cup? Do you want a cup you know is dishwasher safe and easy to clean? My sister is the one who actually came up with a cup solution, and I really like. It looks nicer than typical kid cups. 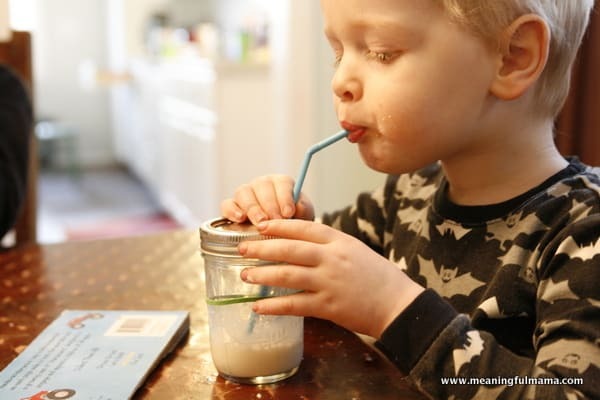 The cup solution for kids is a mason jar. 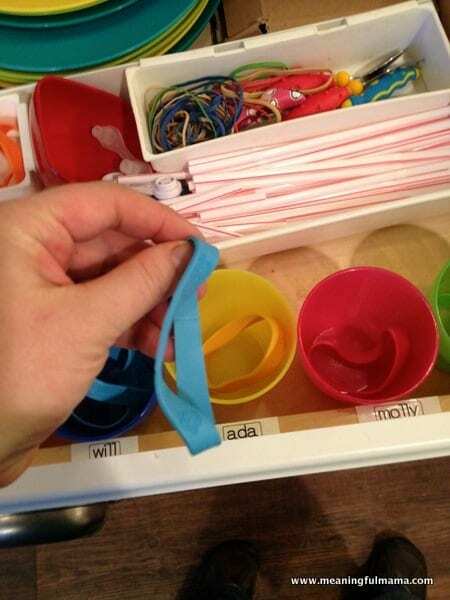 The real secret is having different color rubber bands to represent each of your children. My sister has five kids. They range from age 3 1/2 – 8 1/2. In her drawer she has a little plastic cup representing each child. They each have a color of rubber band that is “their color.” When they pick up one of their mason jars, they just slip the rubber band over the jar. 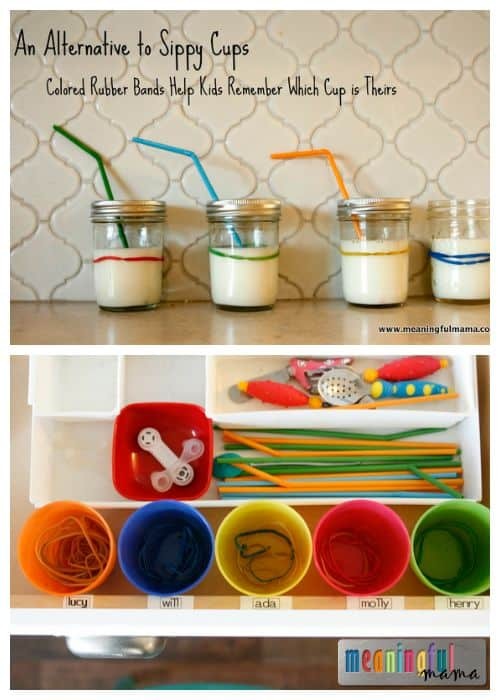 What a great way to keep them organized. I guess the kids love drinking from the jars and having their own color or rubber band. It really helps them identify their drink quickly. The straws make it easy to have smoothies or any other kind of beverage. All you need to do is punch a hole in the top of the lid with a hole punch. These are obviously not meant for littler kids who are still throwing their sippy cups on the floor and all around. They are not spill proof, but they do help to keep liquid in its container. Mason jars are also a lot sturdier than other glass cups. I asked about the hole in the metal, and she reports no injuries. 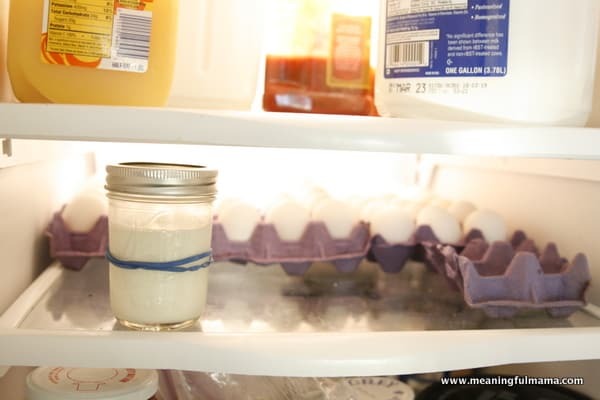 It is easy to store in the refrigerator when not in use. She actually found these thicker bracelet bands online after she took the pictures you see in the rest of the post. She says they are super sturdy, fit right, and will even leave them on in the dishwasher. The first ones I chose have inspirational words too. The second ones are a tiny bit cheaper. I’d love to get my sister to contribute every once in a while. She has such great ideas, and I love her photography. Thanks so much for commenting. Love this idea- definitely going to do this. It’s ridiculous how many cups 2 kids can go through in one day! Cool! I’m so glad you found a solution here. We’ve been doing this plan for about a year now and it does work great. We don’t even do the lid part, just leave it open. Our 2 year old was so excited to have his own big boy cup with his own color he started drinking from the mason jar cup a couple of months ago and has had no spills…yet. And I only have to wash them once a week, be ause all the kids drink is water! Ok, that might sound a little gross. Are my kids crazy, or what? Corban will dump out any water he finds around the house. He know he’ll have a discipline, but it doesn’t stop him. I have know idea how you get your two year old to drink out of a big kid cup. I’ll take some training. And no…doesn’t sound gross to me. I actually added your blog to my favorites and will look forward for more updates. Great Job, Keep it up. Very sweet pics and nice post dear. The kids loved this one. Thank you. Love them , so cute. The rubber band will give the kids a better grip on the jars. had trouble hanging onto shampoo & soap bottles in the shower , so I wrapped each one in a rubber band or two. the idea would work for kids in the bath also . I didn’t even consider the better grip. You’re right. Thanks so much for commenting!